The Regency era ran from 1812 to 1820, when George IV was Prince Regent, although the term often refers to a more extended time frame from 1795 to the end of William IV's reign. A Regency mahogany, rosewood and simulated inlaid writing table (FS18/826) sold in our April 2013 Fine Art Sale for £1,850. It was a flamboyant time of excesses by some and architecturally was epitomised by the Brighton Pavillion, designed by John Nash and Henry Holland in Indo Saracenic style, with elaborate chinoiserie interiors. Other influences on Regency furniture came from Egypt and the Classical style. Amongst many of the furniture designers of the Regency period are the names Thomas Hope, George Bullock, George Smith, John McLean, Morel and Seddon; and Marsh and Tatham. Thomas Hope was probably one of the most influential of the Regency era furniture designers. Enthused by his travels in Europe, Hope's furniture designs reflect the Classical inspiration. George Bullock was another leading light in Regency furniture design, moving first to London in 1813 from his origins in Liverpool and then to Anglesey. Bullock provided furnishings for Sir Walter Scott and also to the government for Napoleon's exile on St Helena. 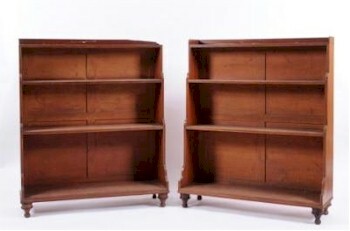 A pair of Regency mahogany and ebony strung 'waterfall' four tier open bookcases (FS18/825) fetched £7,300 in the fine furniture auction within our April 2013 Fine Sale. John McLean (1770–1825) was recognised as one of the best furniture designers of the Regency period, with examples in the Victoria and Albert Museum and in the Library at Saltram House, Plympton, Devon. The partnership of Morel and Seddon was created by George Seddon and Nicholas Morel. One of their contracts was to make furniture for Windsor Castle for George IV and they worked almost exclusively for the Crown. The company employed designers, which included the young AWN Pugin. 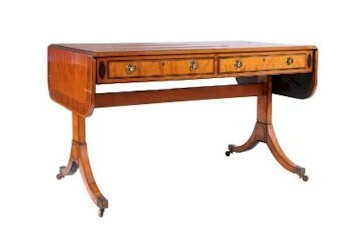 A Regency satinwood and rosewood crossbanded and inlaid sofa table (FS17/835) succombed to a bid of £2,500 in April 2013. 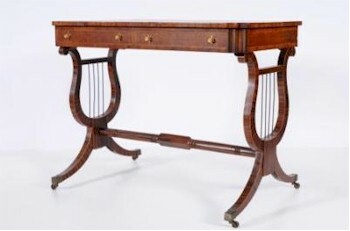 Regency furniture is often included in Bearnes Hampton & Littlewood's quarterly auctions and examples of high quality include a Regency rosewood and brass inlaid breakfast table in our January 2013 fine sale and a Regency mahogany and ebony inlaid library table in our April 2012 auction.